Today I went to Old Goa, somewhat north of Margao, to look at the various Catholic buildings there. First, however, I stopped at the railway station to deposit my backpack in the cloakroom. I checked out in the morning and my train is at 22:40. The bus trip to Old Goa took an hour and half, and included a five or ten minute pause at Ponda while some sort of maintenance work was carried on the bus and I was the only passenger on board. As you can imagine, I was a little apprehensive of what was going on – How long would this take? Would I have to get another bus? – but I sat and read and eventually we started moving again. At the drop off point for Old Goa, there is a statue of Gandhi, and looking along the palm-lined road towards Panaji, you can see a large brown building on the left and a large white building, or complex, on the left. I went to the brown building first. This turned out to be the Basilica of Bom Jesus. The building is, as I said, brown – dark brown, and kind of dirty-looking. Like the other buildings I visited in Old Goa, architecturally, it’s not that interesting – just a large square structure. The stone of its walls have an extremely textured appearance, and look like very weathered, stone-filled concrete. From the references in LP and on the information signs, I gather that this is laterite. Inside, the Basilica is decorated with massive golden constructions, the biggest of which is behind the altar. It also contains the tomb of St Francis Xavier. Across the road are Se Cathedral, the Convent and Church of St Francis of Assisi – the Convent of which is now a museum containing various Hindu and Christian artifacts and what looked to be a portrait of every single Portugese governor of Goa going all the way back to the beginning of the 16th century. These buildings are all physically connected and are square, whitewashed and pretty boring from the outside. The Cathedral is packed with numerous altars and chapels. At the far end of the complex and slightly removed from it is the the very modest Chapel of St Catherine. When I got there there was a school party having their lunch just outside. From there I went round the back of the Cathedral grounds and down to Mandovi River. As open water so often is, the river was flat, as was tree-covered Divar Island across the way and much of the nearby forested land, so this wasn’t much of spectacle. I took a photo of a passing barge. I walked along the road, got growled at and followed a short way by a dog, passed under Viceroy’s arch and went into the Church of St Cajetan. In the grounds was a very impressive tree (one of several, in fact) with a trunk four or five feet wide. The facade of the church, which was based on St Peter’s in Rome, was covered in scaffolding, so not terribly impressive. The inside however, was whitewashed, airy, well-kept (much more so than the Catherdal or Basilica), and pretty splendid. Again, it sported a huge display thingy (I’m sure it has a proper name) behind the altar and the ceilings were decorated with simple but effective panelling. Next on my self-guided semi-random tour were the ruins of the Church of St Augustine. These were ruinous. The main part that remains is half of the tower, which looks almost like it was sliced down the middle. There were some colourful tiles remaining on one section and, like all the other buildings as far as I can remember, many of the paving stones were recycled gravestones. I went into one area where three women were doing something vaguely archeological and was shooed away. Near here is the Church and Convent of St Monica, which I didn’t go in, as such, but I did enter (almost against my own will, as I was getting tired by this time) the Museum of Christian Art, which is part of the same complex. This is a very pleasant place, both in terms of its appearance and because there are numerous fans dotted about. There were numerous silver and gold items – crosses, croziers, reliquaries – the most interesting of which was a silver tabernacle and monstrance, which consisted of a pelican (looking more like a phoenix) tearing its breast and feeding its own blood to its two young, all standing on a globe. This symbolises Jesus’s crucifixion, or something. I walked down the hill from here and stopped for something to eat and a drink. I may live to regret the samosas I had. They tasted OK, but the potato inside was tainted a distressing bright pink, and besides I’m a bit paranoid about food in India. Still, I haven’t been sick so far – not just today, but on the whole trip … actually, I’ve been sick on a couple of occasions, but these were induced by dehydration-induced headaches. Then it was time to head back to Margao. I thought it would be a simple case of standing on the other side of the road from where I got off and waiting for a bus heading to Margao. Apparently not. I was advised that I should get a bus to Panaji (back on the original side of the road) and go to Margao from there. The advice was good. Although it took me a good few minutes of wandering round looking at signs and buses to find buses actually going to my destination, once I did, the journey was straightforward and faster than the morning’s trip out. Actually, I got on one bus (in my experience up to that point, you get on a bus then buy your ticket from the conductor once it’s under way) to be asked through the window did I have a ticket. The answer being No, I was directed to the ticket office. That bus left as soon as I got off, but another one replaced it immediately. On the bus, I talked to an older man called Simon – an Indian – his name presumably coming from the Portugese influence. He took great pains to point out how dangerous travelling in India was: Don’t accept tea off anyone on a train, Keep your money and passport in a money belt, Don’t use taxis or rickshaws after 7pm. Back in Margao, I had a good four hours or more to wait for my train. This is currently down to under two hours. I had a coffee, then decided I needed to go and get some money (having used my last 500 rupee note to buy a 25 rupee bottle of Sprite). I tried three ATMs and they all refused me. I realised that Lloyds TSB must have put a security block on my card again. I went to an internet café and checked my account (not happy about having to have done that, but I’m trusting that the place didn’t have hidden webcams or something looking over my shoulder); there were just the two previous withdrawals I’d made in India showing. I spent a while looking for a telephone place (in India there are shops – telephone cafés, if you will – that provide telephone services; the sign ‘STD ISD PCO’ is quite common). When I did I eventually dialed the right number (the absence of the ’00’ on the number I had confused me), waited for a couple of minutes before getting through to an agent and was told that, yes, there was a block on my card. I asked – nay, demanded – why, but apparently there were no details. I was told I should be able to use my card in 20 or 30 minutes. The call cost me 87 rupees. I headed back to the coffee shop for more coffee, and that’s where I’ve been writing this, so I don’t know yet if it’s worked. It worked. My original thought – before being thwarted by my own bank – was that I’d get 5,000 rs out, and if I needed more later – well, I could get more. In the light of these problems, though, I changed my mind and wanted to withdraw 10,000. Of course, when I used the State Bank of India ATM (there are lots of Indian banks, and many of them have 24-hour cash machines, often looked after by a guard) I automatically withdrew 5,000. Then I remembered and took out another five grand. After that, I bought a pizza from Domino’s (the spicy chicken pizza cost 322 rupees, after tax; I paid with a crisp new 500 rupee note. I got 150 change back straight away, but had to wait about five minutes after I received my pizza before getting the remaining 18) and looked for an autorickshaw to take me to the station. I couldn’t find one (you can’t cross the road in northern India without being propositioned half a dozen times by drivers); there were plenty of taxis and motorcycle taxis (ie, a motorbike – on the back of which you sit whilst being couriered to your destination), but neither of those appeal to me. So I walked. I walked a lot further than the previous day when I walked from the station to my hotel – but this time I went in the front rather than out of the back. I passed a London man by the sound of him on the way and asked him was the station this way; he said it was and asked if the town centre was that way; I said it was. At the station I retrieved my backpack. Whilst in the cloakroom, I opened it up and took out a fresh top – I was pretty sodden with sweat. As I took off my current top and wiped my armpits with it the cloakroom attendant said it wasn’t allowed and started to tell me where I should go. I gave him a brief glance then put on the new top. I ate my pizza on the platform, watched some of the time by a dog with that typically doggy hopeful expression. The train was due at 22:40 and arrived nearly an hour later. On board, all the lights were off, so finding my berth was a case of peering in vain for the numbers and asking if 41 was here. I chatted quietly with a first year student on his way to his university in Manipal (at least, that’s what it sounded like – I can’t find it in LP) until someone told us to leave it till tomorrow. The freshman was getting off at 2am, so we just left it. As noted yesterday, my intention today was to go to a wildlife sanctuary. There are a few of these in Goa, and, Goa being a small place, they’re all in reasonable reach. The one I decided to head for was the Bhagwan Mahavir Wildlife Sanctuary. Lonely Planet says that to get there you get a bus to Ponda, then another to Molem, from where you hire a taxi to take the five kilometres to the reserve’s entrance. I got an autorickshaw to the bus station in Margao (which cost me 40 rs) then after asking various people, I got on to a bus heading for the neighbouring province of Karnataka, which stopped at Molem (this cost 22 rs). Not wanting a repeat of my Tundla trip (where I’d missed the stop and had to go to the town at the other end of the bus’s route and come back), I asked the conductor when we’d arrive there; he said 11:30. At 11:25 we came to Usgao Tisk (I could tell because a lot of shops have their addresses on their signs); Usgao Tisk is on the LP‘s map of Goa, and from there there’s a way to go before Molem. We carried on, and, around midday, the bus chap told me this was my stop and I debarked the bus. I hovered uncertainly for a while, asked a few people if they knew where I could find a taxi or the sanctuary. I was directed up the road and after a short distance came to an entrance for my destination. I walked in, bought a ticket (a basic ticket was 20 rs, but I paid 50 for having a camera), was given a map and sent on my way on foot. There was no sign of any other tourists or jeeps for hire. So I started walking. Immediately, there were a few animals – some cows, some langurs. I took photos and kept walking. The road through the sanctuary was a dirt track of the type with a central line of grass – ie, the track is made by vehicles. But there was still no sign that there was anyone at all around. I felt as if I had the whole park to myself. The walk began very pleasantly. The sound of traffic died away leaving only birdcall, the occasional buzz of a fly, and my own footsteps. The sun was bright and hot, but the forest provided lots of shade. Memorable moments from the walk include, seeing a troop of langurs swinging through the trees (I didn’t have a good enough view to take photos, unfortunately), climbing down into a rocky gully with a stream and having a frog or two jump away from me and hide in the water, waiting several minutes while a small herd of cattle ambled past me. I walked and I walked. Foolishly, I had only brought a little water with me and had been too preoccupied with finding where to go when I got off the bus. I sweated and wondered how long my walk was going to take (the map had no scale). Shortly after I passed the cattle, I encountered some signs of civilisation. A little later, a signpost told me I’d walked seven kilometres. I turned right towards Devil’s Canyon and Colem. Earlier on, I’d thought I could nip out of the sanctuary at Colem and get some water and continue on towards Dudhsagar Falls. By this point, though, I was ready to just exit and head home. When I took the turning for Colem (I didn’t see much evidence of this Devil’s Canyon and wasn’t up for searching for it) a series of jeeps and minibuses passed me. Once out of the sanctuary I walked along the road beside a river that swelled into a series of pools where a few kids played and an old man with two boys did some laundry. I had to walk through a couple of streams running out of one of these little lakes in order to get to the village. The first building I encountered in Colem was the Jungle Café. I gratefully stopped here (walking past a pair of elephants – one young, one old – standing next to a big step-ladder thing for mounting) and had a couple of drinks and something to eat (a lemonade, a tea, and some Goan ‘chilly chicken’; all this came to 150 rs and I left a 20 rupee tip). Rested and partly rehydrated, I decided to get the train back to Margao as the line conveniently ran from here to there. The ticket cost a massive seven rupees (nearly ten pence). I made sure to ask when the next train was due, how long it took and which platform it went from. I sat and read a chapter of I’m OK – You’re OK and drank a litre of water. Then, with an hour still to go before 5:15 when the train was due to leave, I wandered down the platform to where the Vasco-Kulem-Vasco train had been waiting. I was greeted with a handshake by a man waiting with his family. He invited me to sit with them and I reluctantly agreed. He asked me a few questions, which often I didn’t understand. As my awkwardness faded a little, I asked him a bit about himself. He was on his way to Mumbai, having been here for some reason to do with his job; he showed me some watches, clocks and a calculator, which I gathered he sold. With him were his mother a couple of sisters, a nephew and a pair of nieces – and probably some others. One of the sisters got out some coins, passed them to the man, who then passed them to me. They were one rupee coins from the nineteenth and early twentieth centuries, bearing the heads of Queen Victioria, Edward VII and George V. I was a little jealous. I took out my money belt (which has been in my laptop case the last couple of days) and showed them a fiver and a tenner (and a 50 dirham note). The bloke wanted the fiver (worth, I told him, 400 rupees); he offered me 20 rs, but I turned him down. I also turned down the chance to clean my teeth with ash. The mother got out a gas burner and proceeded to make chai. Chai is milky, slightly spicy, very sugary tea (and how often do see five words in a row all ending with Y?). Possibly to my shame, I was conscious of the things I’d read in Lonely Planet about people being drugged on trains, so I shifted my position so I could watch her making it. It was very nice, actually, but on the whole chai is far too sweet for my liking. I hadn’t quite twigged about them going to Mumbai – they were waiting beside my train, so I assumed they were going to get on. But they weren’t. I said goodbye, shook hands with everybody and climbed on board. Where I almost had a carriage to myself. At the next stop some labourers got on with their shovels. One stop further on, they got off and a bevy of young women got on (probably secondary/high school pupils). After a wait just outside the station, the train pulled into Margao at about 6:15. Here, I thought I could easily walk back to the central part of the town (the LP map isn’t very big and has an arrow at the bottom saying ‘To Madgaon Train Station (400m)’). I remembered that the autorickshaw yesterday had turned left out of the station, so, like Aerosmith, I walked that way. I kept walking even though very quickly none of the streets seemed familar. After making a few turnings and wondering whether I should ask for directions and who I would ask and what I would say, I caught sight of a familiar building – the crimson and cream Secretariat – and from there shortly arrived back at the hotel. The day was an interesting and pleasant one, its challenges were minor and I overcame them easily and calmly. My experience of Bhagwan Mahavir Wildlife Sanctuary was fairly underwhelming compared to what was possible. If I’d found my way to another entrance, the experience would have been very different. But the peace and quiet of the walk was quite rewarding – and I wouldn’t have had that experience if I’d been rumbling along in a jeep with a group of strangers. And meeting the family at Colem Station was an unexpected and amiable event. It’s hot down here in Goa. But then, when you spend one and three-quarter days travelling towards the equator on a train, what do you expect? It’s not paralysingly hot though – just at the upper limits of pleasant. It’s also a lot nicer than ‘oop north’. Margao (or Madgaon, I’m not sure which name to use) is a modest enough place, but is devoid of the oppressive air pollution and carpet of refuse that characterises northern cities. As a result, you can see the sky, and you can breathe without developing a rattle of dust in your chest. After going on the internet this morning, I looked for the Café Coffee Day mentioned in LP – and found it. I did some writing, then began to think about how to spend my limited time in Goa. The conclusion I came to was to go to a beachy place today, try heading to a wildlife sanctuary tomorrow and explore Old Goa on my final day. My train on Sunday is at 22:40, so I’ll leave my backpack at the station and hopefully get back well in time to catch it. I should arrive in Thirvananthapuram (which I think is pronounced TI-roo-van-an-ta-poo-ram, on the basis that I’ve seen it split into two words between the third A and the P) on Monday morning, and I’ll be there for five nights before heading away from the equator again and to Mumbai. There are, of course, lots of options when deciding which beach to go to in Goa. Colva is the nearest, and when I was approaching the bus stop there was a bus to Colva just pulling out – so I hopped on that. Decision made. The fare was eight rupees. I gave the lad collecting money a choice of my available change – seven rs small change or a 50 rupee note – he chose the seven. After a short ride, the bus arrived at a small, sandy lot bounded by restaurants and shops, hotels and a stream with two footbridges. The bridges led to the beach, so after acquiring a 7Up, that’s where I went. Lonely Planet describes Colva beach as being relatively undeveloped, but also not especially pristine. Seemed OK to me, but, cutting a dash in my boots, long trousers, long-sleeved top, hat and with my laptop case slung over my shoulder, I’m not really into beaches. (Why go, then? you ask. Well, you can’t really go to Goa and not visit a beach.) I walked about a kilometre south, stopped to take some photos and walked back, wandering into the palm tree woods that border the littoral and having a look at the land behind. 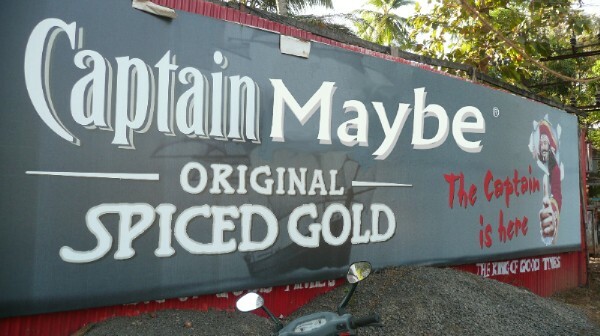 When I got back to the bus stand area I strolled along the road inland, took more photos of a church, a cow, and a billboard that read, ‘Captain Morgan – Original Spiced Gold. The Captain is here.’ On the way down the road there were a number of souvenir shops I noticed one quite nice cat figurine. On the way back, I stopped at this shop to have a closer look; it’s brass and quite heavy, but at least its unlikely to break in transit. The guy wanted 850 rupees for it, and I haggled him down to 700. I’m sure I could have done better, but how much energy am I willing to spend on the effort? Not a lot (as Paul Daniels might say). Then I stopped for coffee and samosas at the Café Coffee Day – which is where I’m writing this. And, as there is no more past for me to describe to you, I must stop. The Goa Express pulled into Madgaon station at about 7:15 this morning, only slightly late. I had no idea where I was going to stay, so, while on the platform, I retrieved my Lonely Planet from my backpack and found that it only recommends one hotel in the town (favouring, instead, the beach towns) – the Residency. So I went there, but it was full. The lady at reception (ladies on reception! This really is different from the north of India) directed me to another hotel just down the street: Hotel Saaj. The room is possibly a bit pricy at 450 rupees (plus 25 rs tax), but it’s OK. The TV has the best range of channels yet – CNN, BBC World, Animal Planet, Discovery and National Geographic in English. I showered and shaved … no, in fact, I shaved and showered – the distinction is important. Went down for breakfast and the waiter singularly failed to understand anything I asked for. Eventually, with the help of another member of staff, he took my order and I received my cornflakes toast and omelette (I had to ask for my tea – the most important part of any meal – again). My omelette came with two spoons. I asked for a knife and fork, and he brought me two forks. I asked for a knife and he seemed to indicate that they didn’t have knives, but he went to his cupboard and brought me one anyway. The two Americans I was hoping to hook up with while I was here had their train cancelled and couldn’t get another. Which is a bit of a disappointment, but at least their plans to come to Goa and invitation to hang out here made me make some intelligent plans for the rest of my stay. Now I just have to figure out what I’m going to do with my two days here.